It may sound cliche but it truly is the heart of my home, my blog and my magazine. Even though I have an office in my home, I find myself drawn to this light and airy space with its cool blue walls and cream furniture, these soothing colors are a balm to my busy mind. Most days I can be found either sitting at the dining room table making lists, working on my laptop or trying to organize items for yet another photo shoot or I'm behind the stove testing a new recipe. And because the space is flooded with beautiful natural light it also serves as my photography studio. I love decorating and DIYing so I am always "tinkering" with things in my home. I've painted almost every piece of furniture in here which has been a wonderful way to help mismatched pieces of furniture live in harmony in this small space. I have dreams about adding a new backsplash and a few other updates in my kitchen but until I get around to those I am enjoying simple updates like removing a couple of cabinet doors to reveal space to showcase some of my favorite props and treasures. It does a great job of breaking up the "wall of white" and didn't cost a penny!! And if I get tired of it, I can simply screw the doors back on! I love having fresh flowers in my home and am so grateful that my parents allow me to regularly clip blooms from their garden. 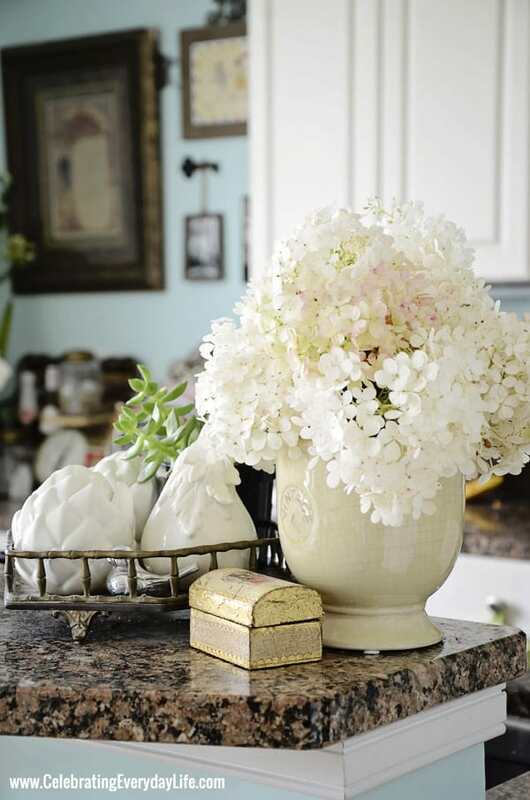 For me, there is nothing like fresh blooms to instantly make a room look (and smell) "prettier". I have lots and lots (and lots) of accessories for photo shoots and not a lot of storage space so practically every available surface is filled with items waiting to be grabbed at a moment's notice and used to embellish a photo. There is also a small TV in this room which sits on a chest in front of my all-time-most-favorite mirror project ever! This mirror was such an easy project and I'm still so proud of how it turned out. The "Keeping room" part of my kitchen/dining room is the fireplace area. I sit here every morning enjoying a cup of hot tea, reading my bible and mentally preparing myself for the busy day ahead. While I hardly ever light a fire, I still find it to be a cozy corner that is perfect for catching a few quiet moments before my day takes off. And there you have it, a tour of "my favorite room!" Thank you so much Kim for inviting me to share it, I am truly honored!! Thank you, Jennifer, for sharing your favorite room with us. I know y'all want to see more so pop on over to Jennifer's and take a look around. She has some beautiful photography on her blog and she has a magazine she creates, too. You can find all past favorite rooms here. Beautiful, love the brightness with the colors. :-) Kim thanks for sharing with us today and Jennifer your home is just beautiful, can not wait to read more. :-) I hope you both have a great day! thanks, Kim, for featuring this beautiful home. So beautiful!! I went to the Parade of Home this week and fell in love with so many things. One was a pair of curtains I just wanted to take off the wall and stuff in my purse! It is the same material on your dinning room chairs. Love it!! What a gorgeous room!! Love your taste. Thanks for introducing me to a new great blog, Kim. It's a beautiful room! Thanks Kim for having Jennifer share. What a pretty space and it's filled with so much eye candy!! Love that beautiful mirror! You made my day Kim...I am so happy to see Jennifer's gorgeous "favorite room" here today....I love Jennifer and her beautiful blog.....her area is truly so "happy"...you cannot feel any other emotion but happiness in the room..so many stunning vignettes to see...and I want those bar stools!!! So thanks Kim and thanks Jennifer for presenting your favorite room to us today! I am a primary color girl, but I just love the soothing colors of your home. I have a cabinet on my porch painted yellow and for a minute you had me thinking about an aqua for it. But then, it would be one of those things that led to me repainting everything else. Thanks, Kim and Jennifer for showing us your favorite room! I have been following Jennifer for awhile but missed the mirror post so have to go look at that too. LOVE this area too, so bright and cheerful. Have a great weekend!!! Thanks Kim for showcasing Jennifer's luvly home. Lots to see and drool over. The pop of aqua against the cream is beautiful! Jennifer's home is so lovely!! Love the light colors she has used. She has truly created a fresh and inviting nest!! Love this room! I could definitely live here. HI Kimmie! Oh, I love her beautiful home and knowing she's done so much to it herself makes it even more special. I love this series. Love it! Such a beautiful peek. Jennifer decorates so wonderfully. Full of interest, layers, textured. A real treat!! Thanks for having her Kim. Thanks for sharing Jennifer's favorite room with us. I love her use of the pretty blue and red with her white. Very bright and cheery. Jennifer's room is gorgeous! I love the pops of red with that beautiful shade of blue. Her magazine is always filled with stunning photography and great features too! Thanks for sharing her room today Kim! Jennifer's home is lovely. I absolutely love all the natural light in her spaces, and the white and blue color scheme. Beautiful. Now I have to pop over to her blog to see some more. Thanks for sharing. Jennifer's space is fresh and charming. 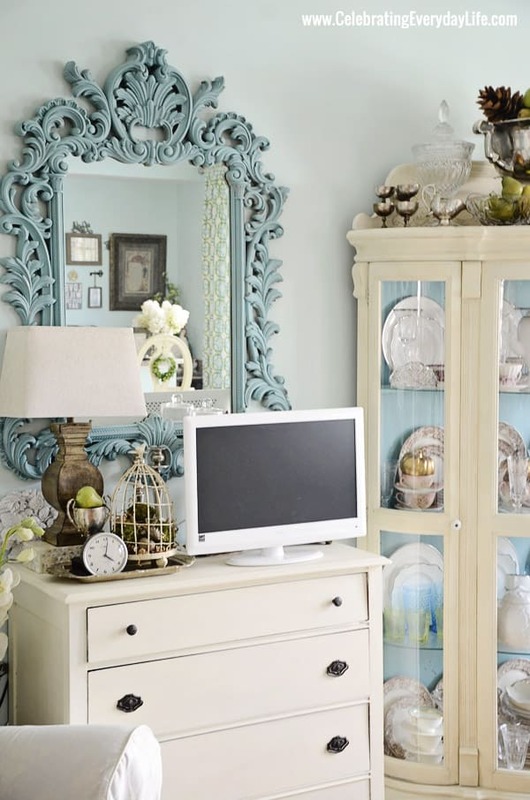 Love the turquoise mirror. Great choice to feature Jennifer, Kim! She one of my very favorite bloggers. Truly a gal with a golden. 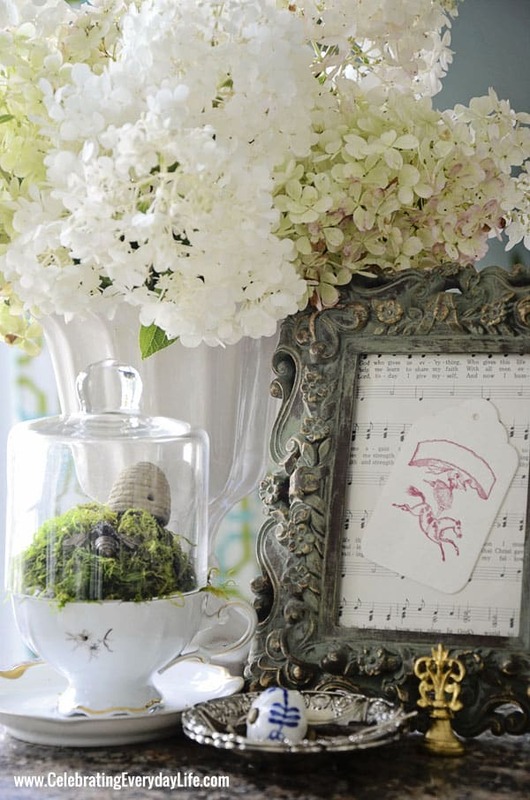 And she creates the most amazing and inspiring vignettes and table settings....and her favorite room is no exception. What a joyful happy place in which to live. I can't wait to see her magazine's new fall issue. Oh my gosh how beautiful! Heading over to her blog now. Oh this living space is sooo calming and soothing. I love the soft colors of the blues and greens. Thank you so much for sharing this beautiful space. Have a great weekend! Love Jennifer Carroll! 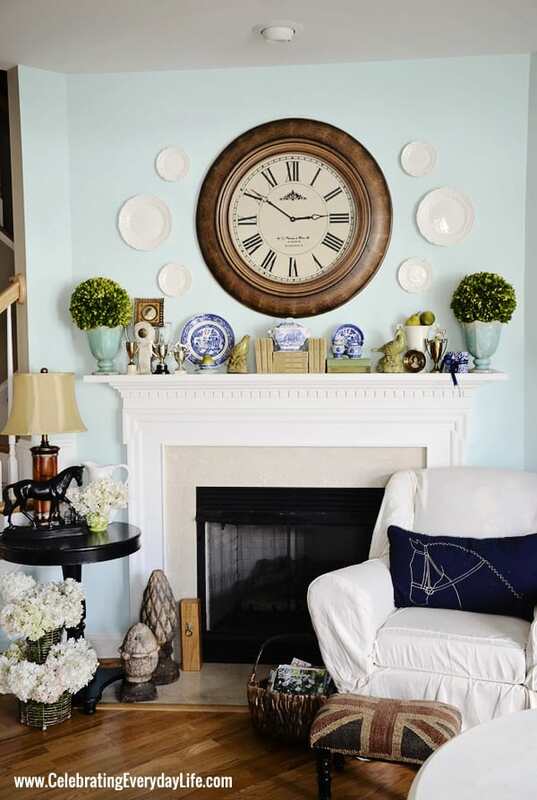 Love all the blues and creamy whites in this space! Kim, I was in World Market and saw this pillow yesterday that reminded me of you. This room is so inviting! My favorite colors. 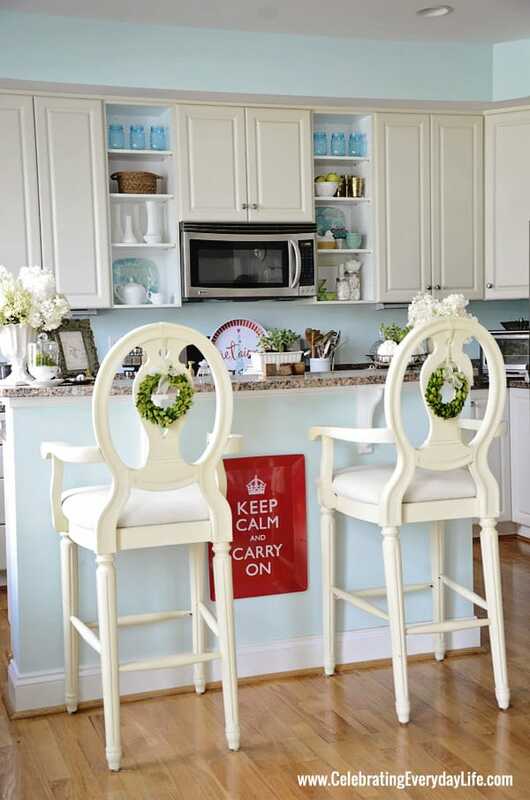 I love the "Keep Calm & Carry On" sign on the front of your center island. Thanks for sharing and all the inspiration. 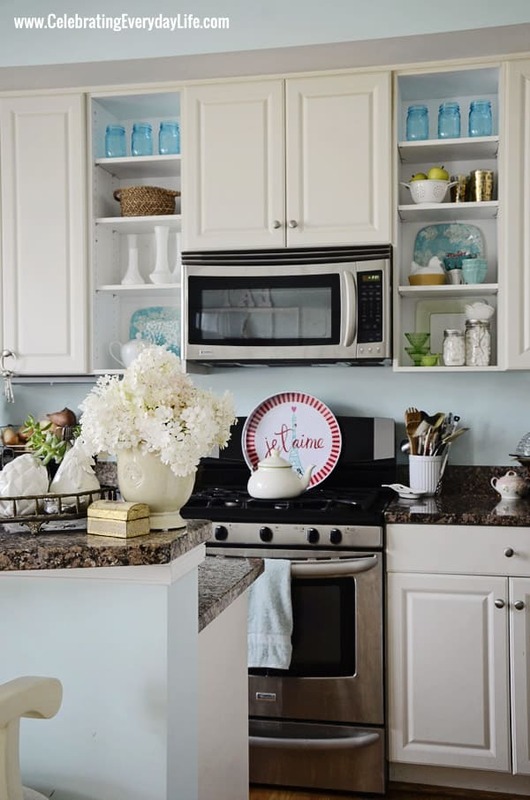 Jennifer's kitchen is absolutely gorgeous! Love ...love that color! She is a woman after my own heart. What a beautiful room and those hydrangeas are stunning. On my way over. Such a beautiful, serene place! I can definitely see why it is the heart of the home! The photo of the fireplace area is just breathtaking! What a gorgeous home - her use of colors is just brilliant!!! Love the miniature wreaths on the barstools! Thanks so much for showing Jennifer's favorite room. I enjoyed meeting her at Haven and now I'm a huge fan! What a charming room. I have a curio very much like yours and I love that you painted it white with the beautiful aqua inside. I am inspired to do mine like that very soon. Thank you so much for sharing! I can see why this would be her favorite area. So fresh and bright. I enjoyed meeting her at Haven. Love the blue and fresh flowers very nice!